At a recent communion we were delighted to welcome four new members to our congregation here in London. On this occasion all of them happened to be Brazilian! 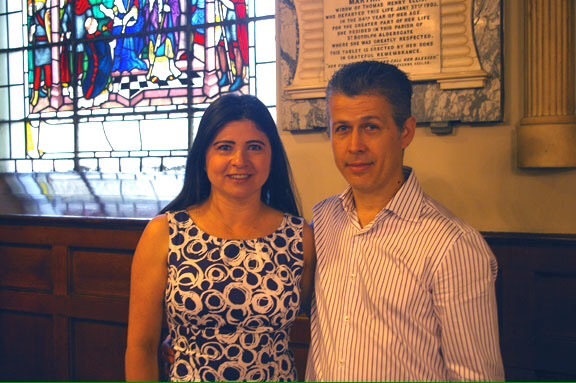 Claudio and Marilene (pictured above) have lived in London for several years and they have a 12 year old daughter, Rachel. Claudio used to be the minister at a Brazilian church in south west London and now works as a plumber. Marilene is a primary school teaching assistant. Tiago and Enny have attended LCPC for a couple of years now. Tiago is doing a Masters in Investment and Risk Finance at the University of Westminster, and Enny is doing a PHD in epidemiology at the London School of Hygiene and Tropical Medicine. Earlier this year, she travelled to Angola as part of a rapid response team during an ongoing yellow fever outbreak. We thank God for bringing these new members to us and pray that He will richly bless them.